For those who want to break out from the box. Every once in awhile, someone will comment that they, “haven’t seen any new recipes on the food blog in awhile” – and I sheepishly look anywhere but in their eyes when I explain that I let scratchbatch slip off to the sidelines while I did “more important things.” I’ve been cooking like the rest of us, but finding the moments to record those kitchen expeditions somehow became increasingly difficult. In the time that’s elapsed since I discussed scones in all their glory, I have written many papers, earned a degree, lived abroad, and returned home. With time on my side and a desire to jump back into my little culinary universe, I thought a second attempt to rejoin the blogosphere might not be such a bad idea. To get back in the groove, I’ve got an easy and deliciously messy sandwich suggestion that might just redefine your concept of “breakfast for dinner.” I present to you: the croque (et oui, with a French name, it sells better !) 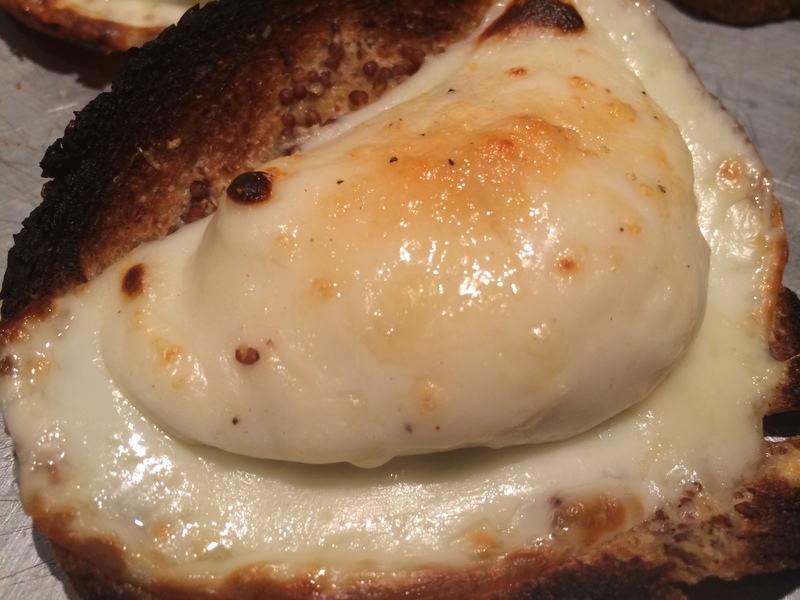 or upscale, reinvented grilled cheese. I wasn’t impressed or tempted by the idea of hot soup on a hot night. 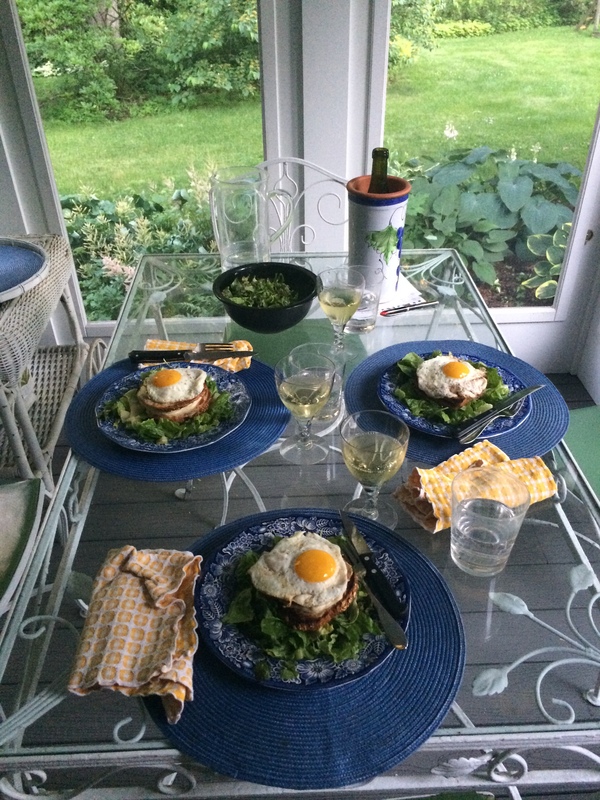 Voicing my opinion, we somehow started discussing the croque madames we’d eaten in France. I thought about it for a moment…when Mom declared, “If you can make it, that would be great !” Dad, behind two pairs of glasses, nodded his consent. So off to the kitchen I went to make this classic, French-inspired snack. 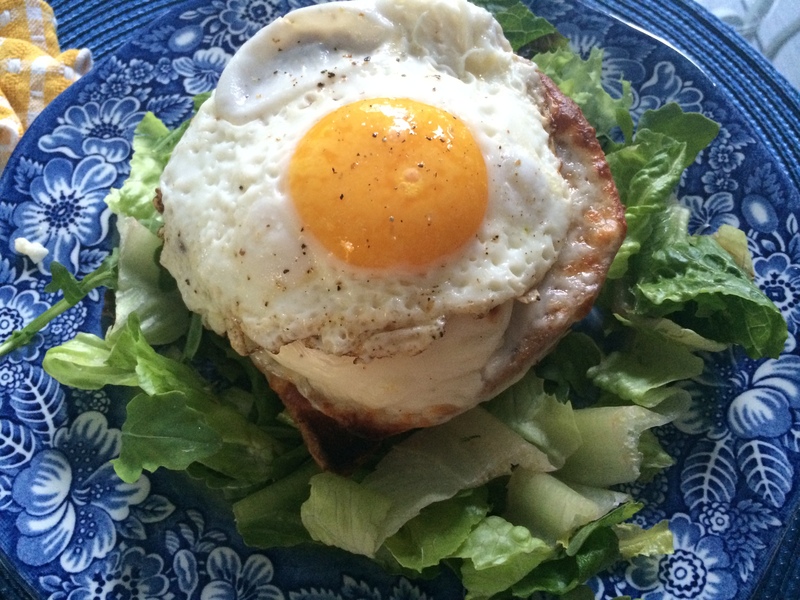 Any bar/café in France will likely have a croque monsieur or a croque madame on their menu. It’s standard quick eats, a sort of Frenchie fast-food that may have gained it’s popularity in the Paris of the late 40’s. 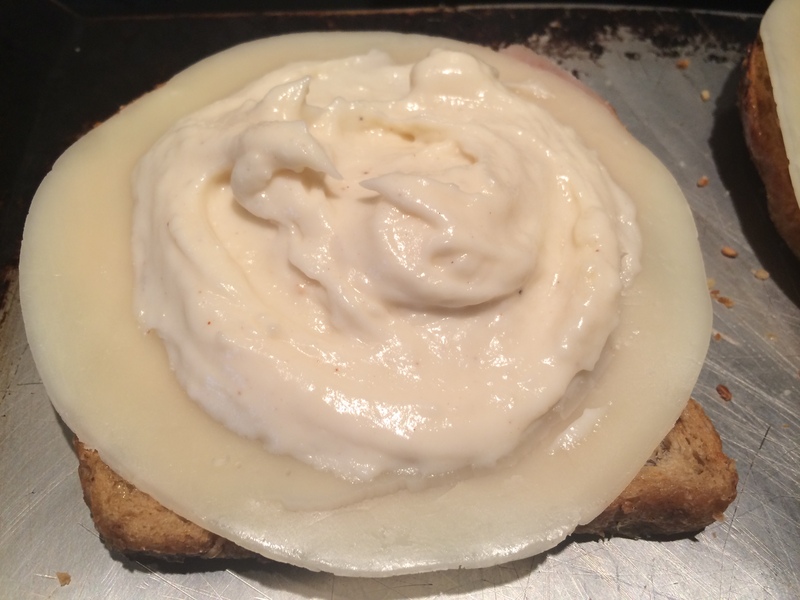 The essentials stand as such: thick slices of bread, a little béchamel sauce, ham, and melted cheese. The madame, in somewhat Gallic humor, is topped off with an egg (so named for the hat styles fashionable at the time…though I could think of other reasons…) while the monsieur touts but ham and cheese. Usually, this sandwich is made with gruyere or emmenthal cheese, but those are less likely to be in an American refrigerator. I used pecorino/parmesan, swiss, and provolone to great effect. 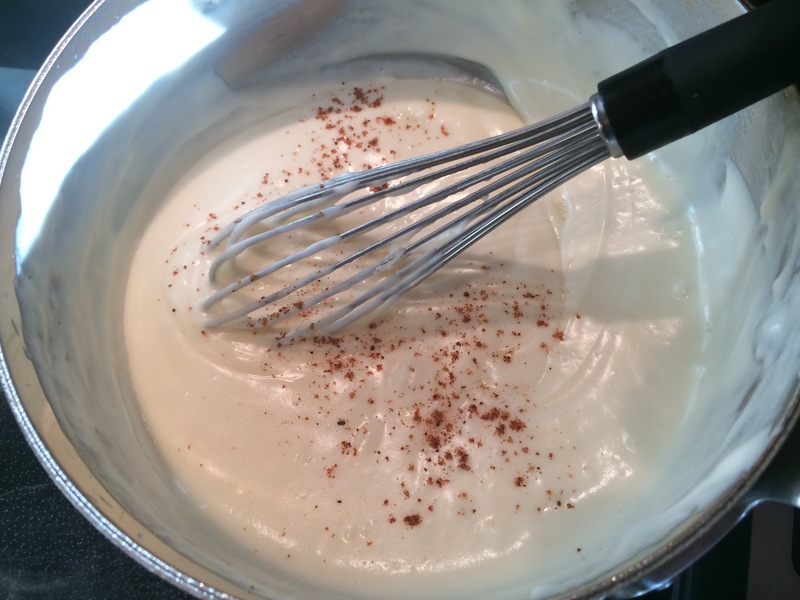 Don’t let the béchamel scare you off – it’s very easy to make and takes little time. Put on the Amélie soundtrack, open a red wine, and whip up these fancy (and filling), French-inspired sandwiches. NB: Have the milk and cheese at the ready before beginning the sauce. 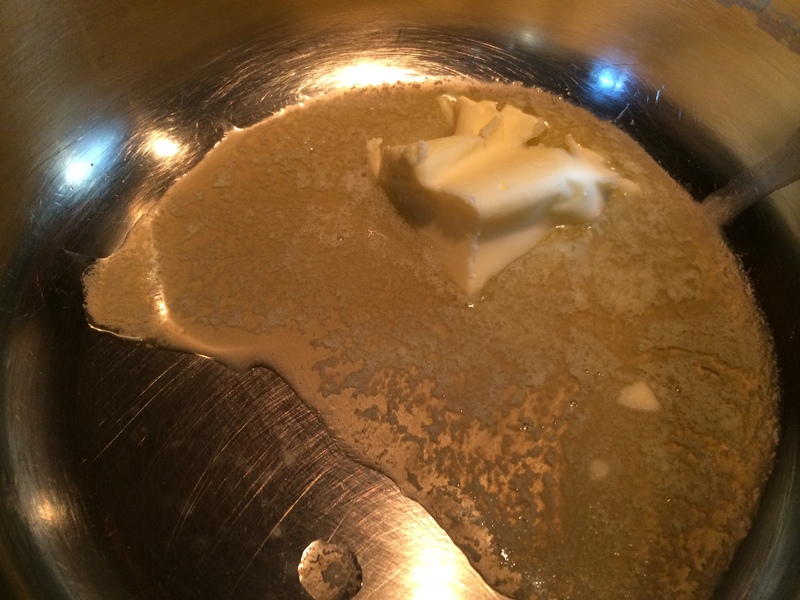 In a medium-sized saucepan, melt the butter over medium-high heat. 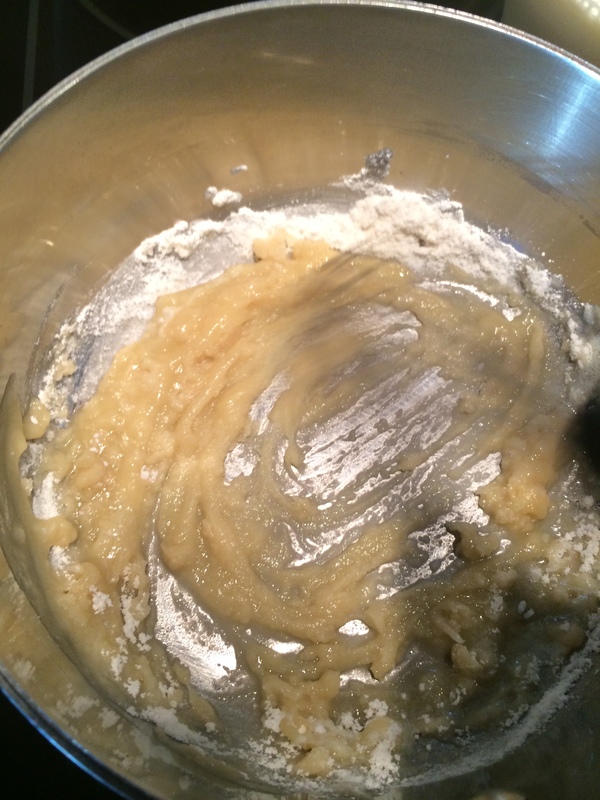 Add the flour and cook, whisking, until smooth and lightly browned. 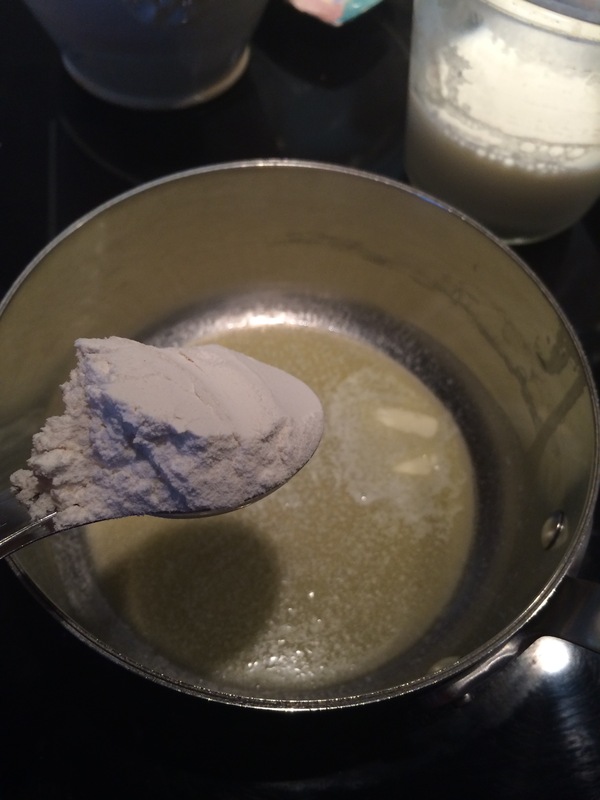 It’s important to incorporate the flour and the butter; the flour will be the thickening agent for the béchamel sauce. You also want it to change color (becoming somewhat golden in hue) in order to remove some of the floury flavor. This will all happen fairly quickly, so don’t dawdle and keep mixing ! Pour in the milk, continuing to mix constantly. 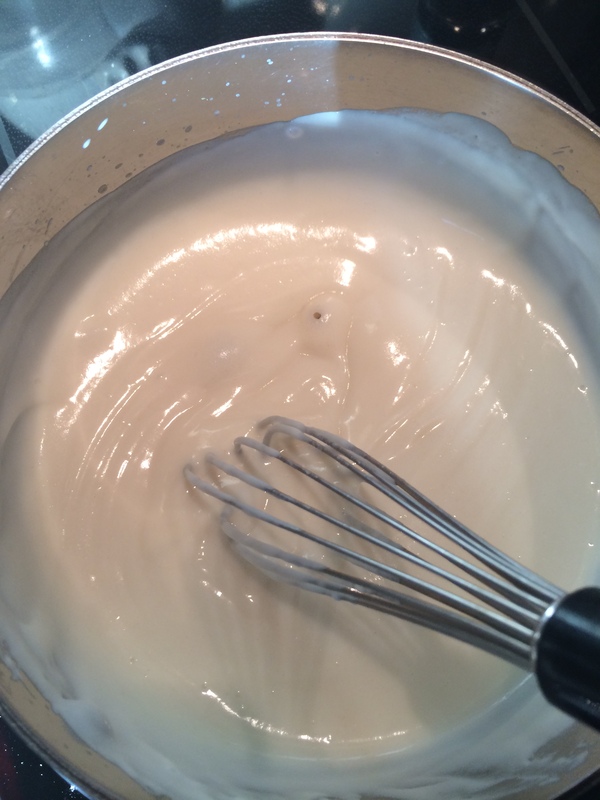 Let the mixture come to a boil before reducing the heat until thickened. I usually continue to whisk and before my sauce has begun to fervently bubble, it has adopted the viscosity of molasses (desired). 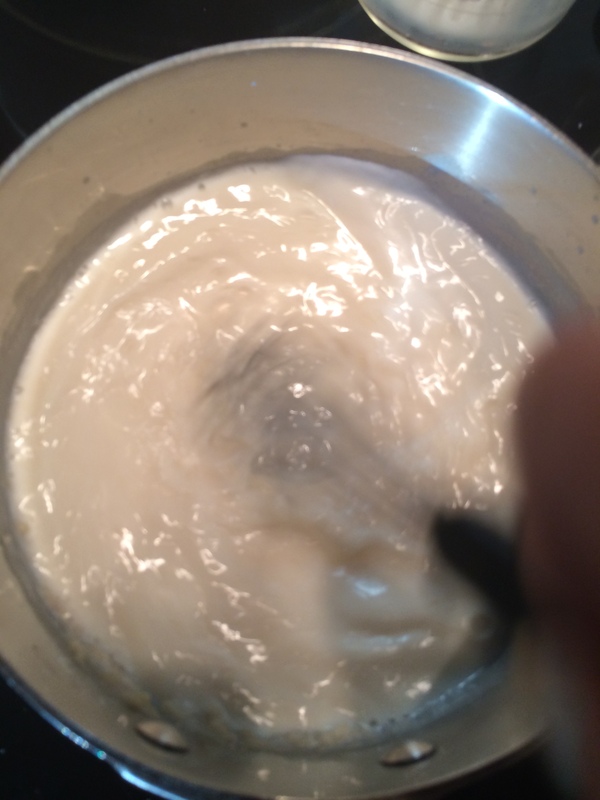 Add the cheese by handfuls, mixing until smooth and melted. Taste – if you want more cheese, add it now. Season with a little salt, cracked pepper, and nutmeg. Be sure to sample before setting aside. Heat broiler. On a large baking sheet (you may cover with parchment paper if desired – I did not, and had no trouble removing my toasts), place the 6 slices of toast. 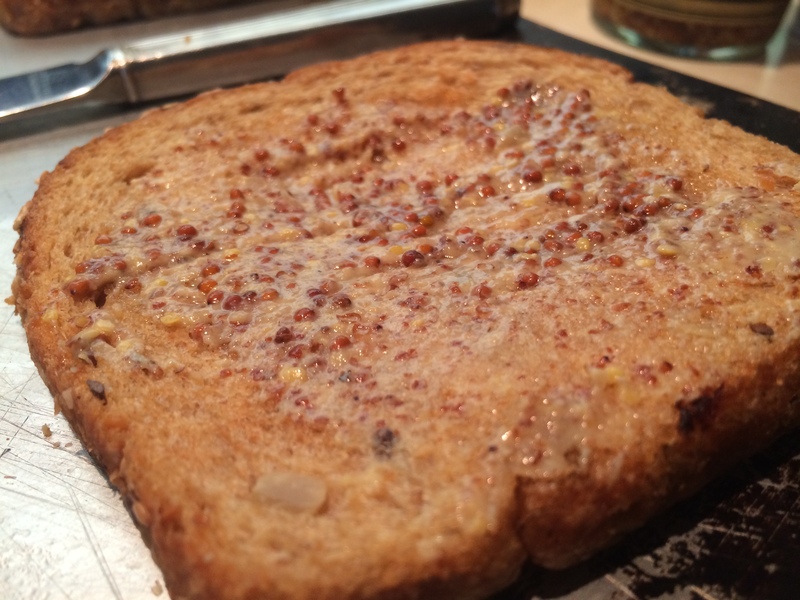 Spread a generous spoonful of mustard on each slice of bread. If mustard isn’t your favorite condiment, butter is a likely substitute…but really, trust me on the mustard front. It’s delicious). 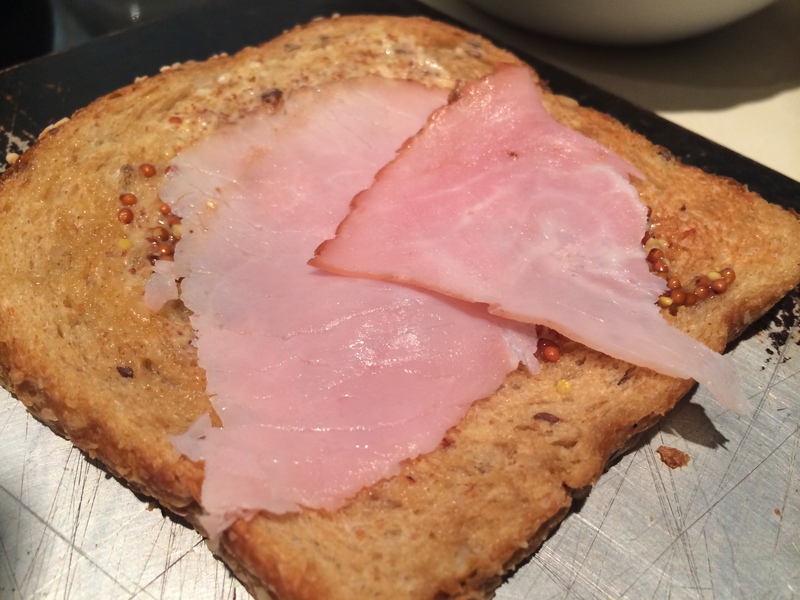 Top each toast with a slice of ham and a slice of cheese. We were cleaning out the fridge, so I did three with swiss and three with provolone. It was so good, I might always do it like that…but you may choose whatever cheese cocktail you like. Top each toast with a generous dollop of béchamel sauce. 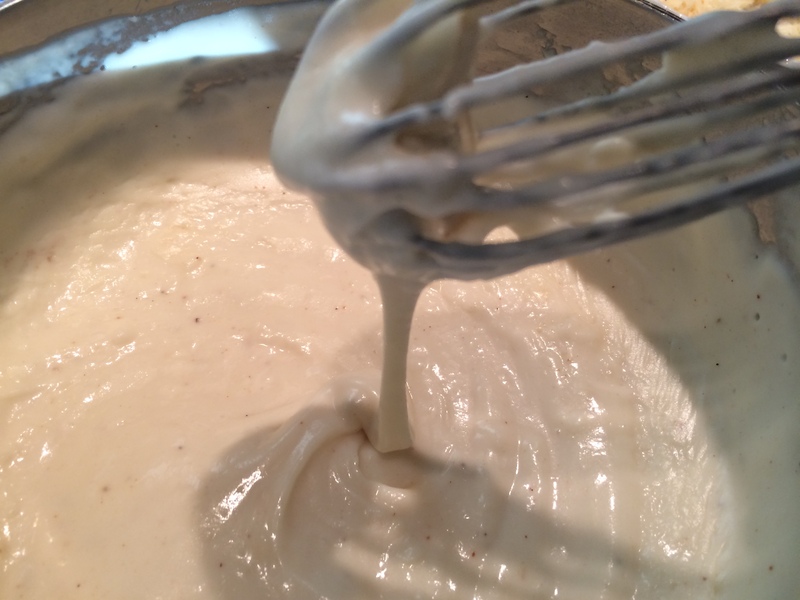 Place tray in oven for 1-3 minutes or until the cheese sauce is bubbling and evenly browned. Please note that it is wise to cover the toasts as completely as possible so as to prevent them from burning when facing the heat of the broiler. Remove from oven and get ready to fry some eggs. Heat butter in a skillet over medium heat. Add salt and pepper to melted butter. Once the pan is hot (I test this by flicking a bit of water at the pan. If it sputters madly, it’s ready to go), crack an egg into the pan. It will cook fast – I like to run the edge of the flipper under the egg about midway through the cooking process to make sure it doesn’t stick to the bottom of the pan. 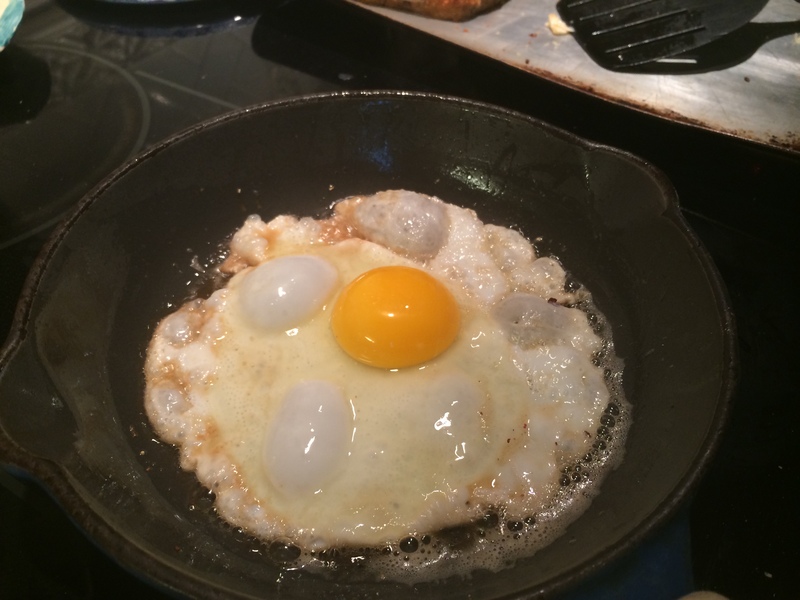 Cook until the whites are set but the yolk is still runny…maybe 3 minutes in the pan. If you prefer the over-easy approach, go for it. I placed ours on a bed of greens (like arugula) but one may just as easily leave those out. Take one toast and place it on the plate. Top it with a second toast. 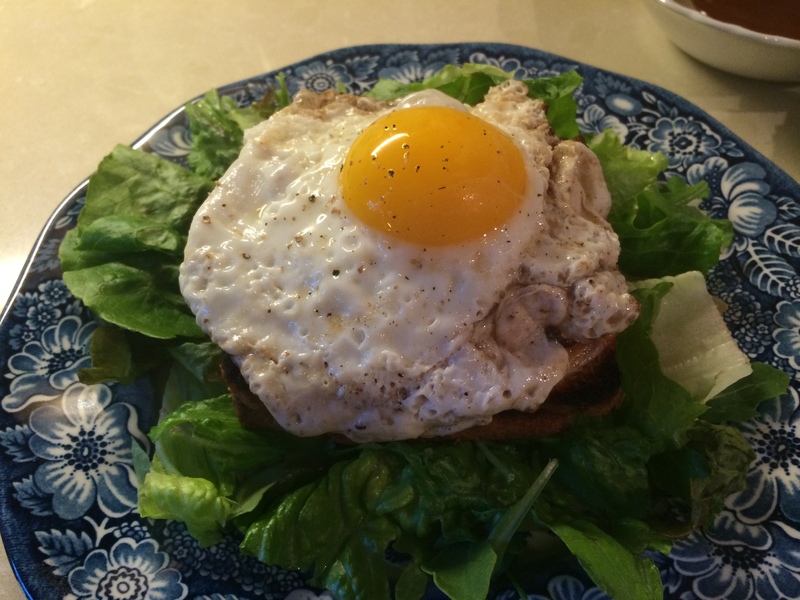 Just as the egg is cooked, place it on top of the sandwich and devour right away ! The best part is watching the yolk drip down over the combination of melted cheese, bread, and béchamel. Bon appetite !